Thank you all so much for your feedback on my trousering dilemma. Having prevaricated for long enough, I've decided to to go with the Juniper pattern, but will narrow the width of the legs. Now that I've decided on the pattern, I feel like I can relax a little, although I would like to wear them during the summer months so I can't rest on my laurels for too long. 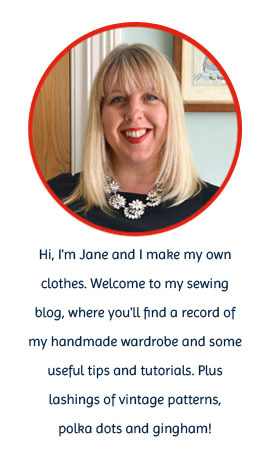 Let's move swiftly on to my current challenge instead - Sew for Victory - over at Lucky Lucille. It didn't take me long to decide to jump aboard this challenge - of all vintage eras, it's the 1940's that really make my heart skip a beat. It's my favourite style decade, mainly because of the dressmaking details: the knee-length gored skirts, the fitted waists, the abundance of shirt dresses, the interesting collars and the pretty sleeves. I also love the fabrics - feed sack, tiny flowers, cherries (! ), gingham, polka dots - I'm practically weeping with joy writing this! 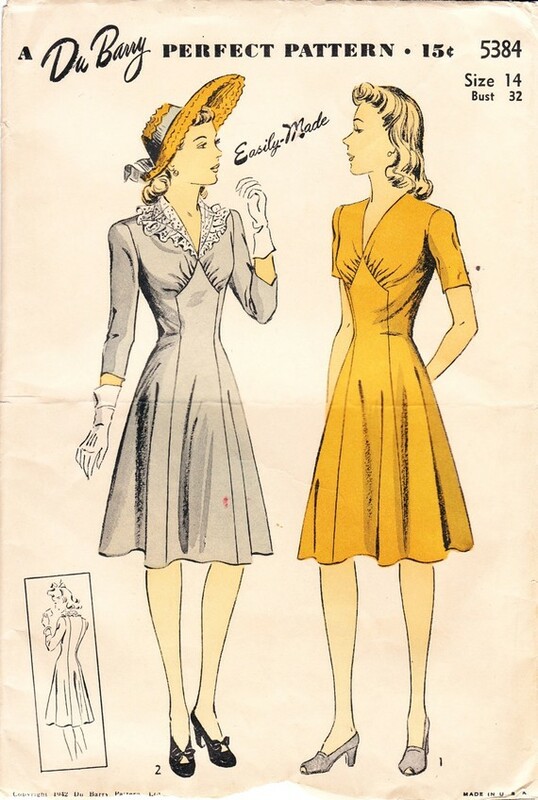 My own track record of sewing from the 1940's however is pretty rubbish: two pairs of Simplicity 3688 repro trousers, here and here, and the Colette Oolong dress which is 1940's inspired. I've never actually sewn anything using an authentic 1940's pattern before. This challenge will give me a chance to remedy the situation and hopefully learn an awful lot in the process. My 1940's pattern of choice is Du Barry 5384, which has a really interestingly shaped central panel extending all the way to the hemline. I pinned it to my Pinterest board a few weeks ago, but I never realistically thought I'd ever have a chance of finding the pattern. You can imagine my screams when I put in a search on Etsy and found one for sale at an affordable price and in a size that would probably fit me…! It's very similar in style to the Colette Oolong, but with a few crucial differences. The Oolong is cut entirely on the bias, which, I'll be frank, is pretty traumatic in all kinds of different ways. The one advantage of it being bias cut is that there's no need for a zip. 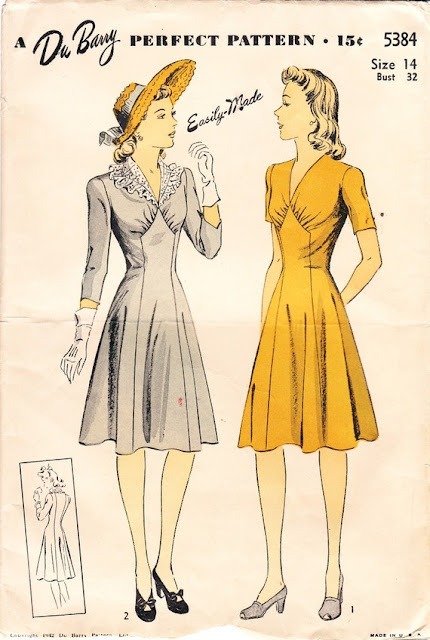 My Du Barry pattern includes one of my most hated sewing features - a side zip. I loathe them so much I've decided to put in a longer, central zip down the back of the dress instead. In a rare move, I'll also be making a muslin as I'm not 100% convinced a 1940's size 34 will be big enough, especially the bust section. I'll keep you updated on that one. Now onto fabric - I learnt my lesson with last year's Mad Men Challenge. I used a synthetic fabric which on the plus side was the right colour and turned into a lovely fitted dress that Joan herself would have been proud to wear. But on the downside, the fabric was so bleugh that I've never worn it, it just feels like dinner lady smock fabric, maybe it is for all I know? This time, I just happen to have the perfect fabric in my stash, a charcoal grey polka dot cotton I picked up at Walthamstow market at the last meet-up. It was very inexpensive, but I was really impressed by its lovely drape and quality. I sincerely hope it turns out to be a bargain of the century and not a near relative of a dishcloth after one wash. As it's so drapey and lawn-like, I'm going to underline it with either cotton muslin or silk cotton, I haven't quite decided which yet. I'll be cracking on with my practise muslin this week and will post pictures soon, I promise. In the meantime, here's a puzzle I'm hoping one of you vintage pattern experts out there can solve. The image of my pattern on my Pinterest board featured a grey dress on the left and a yellow dress on the right. Yet the pattern I purchased - the exact same pattern - features a green dress on the left and a red one on the right. What's going on there then? Kelly skirt: hit or miss? Do you ever see a garment on a sewing blog and have a burning desire to make an exact copy IMMEDIATELY? You do? Oh good, I'm glad I'm not the only border-line stalker out there then ... 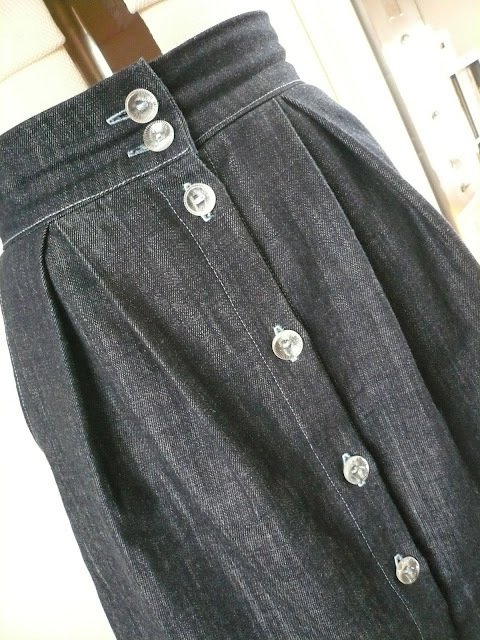 I had my most recent moment after seeing Roobeedoo's denim Kelly skirt by Megan Nielsen. It was, in a word, perfect: the cute buttoned front, the high waistband and the fact that it was denim. Denim! You all know how much I love a neat denim skirt - I knew I had to have one the same. I sheepishly contacted Roobeedoo at this point, letting her know my Single White Female intentions. Being the fine, generous woman she is, she graciously gave me her blessing to blatantly rip her skirt off, along with some construction tips and advice on lining! You gotta love Roobeedoo! I used the same Japanese denim from Our Patterned Hand as Roobeedoo, but when push came to shove, I just couldn't be arsed to add a lining. My denim Ginger isn't lined and it's never given me any trouble, so I winged it. I used a light blue thread for the top stitching and buttonholes and vintage glass buttons. Top tip: be very careful not to drop glass buttons on the floor, remember, they're made of glass so can break. Ask me how I know....! Size-wise I made a small and it fits well, I didn't make any alterations, apart from hemming it half an inch longer than it says on the pattern. Let me state for the record that the Kelly skirt is a VERY easy skirt to make, two front pocketed pieces, a back piece, some pleats and a waistband. Hoorah. Yes, there are seven buttonholes but that's still five fewer than the other main player in the button front skirt world - the Colette Beignet. I've made the Beignet twice (here and here) and although I love it to death, it does probably take about three times longer to make than the Kelly skirt. So, I've made a carbon copy of Roobeedoo's skirt, same pattern, same fabric, a good fit, easy to sew. Surely I should be skipping around with glee, punching the air at this point? Well, not really. It wasn't the love at first sight I was expecting - just because a garment looks wonderful on one sewist, it doesn't necessarily follow that it will be a perfect match on you. On the surface, it includes all the features I like: A-line shape, nice buttoned front, high waist, but I don't really wear skirts with pleats, just as I don't wear gathered skirts, I'm not used to having so much volume around my waist. And I think that's what I need to get past with this skirt, it's a different shape than I'm used to, that's all. I think it's quite healthy to be dragged out of my sewing comfort zone now and again, so I'm giving it the benefit of the doubt. Lucy bakes cakes. Now I'm not talking about a batch of fairy cakes with a bit of icing on top which is what I 'bake' with the children. I'm talking about exquisite birthday and wedding cakes, cupcakes that truly are a work of art, and delicious, old fashioned favourites for her Vintage Tea Parties (more on that in a later post....) Her fabulous work can be seen on her blog - Vanilla Frost Cakes. Anyway, Lucy needed a special bag to transport flat boxes of cupcakes. She'd bought a cake-transporting bag previously, from a cake supplies website, but it was made from that strange, shiny sacking that council recycling bags are made out of and consequently, any stray bike or scooter in the boot of the car meant the fabric snagged or ripped. She wanted something made from a strong, durable fabric, preferably in a darkish colour that wouldn't show the dirt too much. 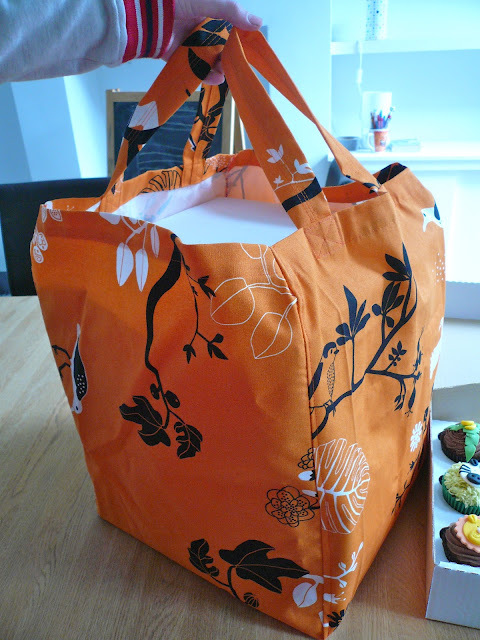 I had just the thing - a lovely orange, bird fabric from Ikea. It's a decor weight and I've used it to make bags with before now, as well as aprons. She described exactly what she wanted - a cube shaped bag with handles that could accommodate four boxes of cupcakes snugly on top of each other. After a bit of research I worked out that the easiest way of making it would be to cut a square out of each of the corners so I was left with a giant-sized plus sign. Then, after adding handles and finishing the top edges, I just had to sew the sides up. Pretty easy really. I tapered the top corner edges in by about half an inch each so they didn't gape open and would hold the cake boxes a little more snugly. Making a bag this way means that one side is always going to show the print upside down if you use a directional print. However, I don't think anybody is going to be shaking their head sadly at the upside down bird on one side of the bag, when this is what's waiting for them inside it. Mmm, cupcakes. Now that I've worked out how to make these bags, I can knock up more for her, as they only take about an hour to make. If you want quite high sides to the bag, as Lucy did, then you will end up with four large squares of redundant fabric after you've cut the bag out. They won't be redundant for long though, they're the perfect size for cushions - I love it when that happens! Ooh crikey, Karen's been dipping her hand into the Sewlutions Jar and pulling out names at random. 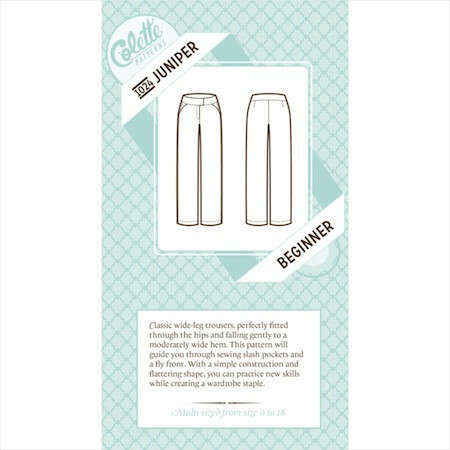 I thought I'd better at least start thinking about my Sewlution, just in case she does it again and catches me unawares (a bit like an Ofsted Inspector swooping down on a school with an hour's notice…) My Sewlution is to make a pair of trousers with a fly front in 2013. That's still going to happen - it has to by the law of the jar - but I can't for the life of me decide which pattern to use. There are two contenders: the Thurlow trousers by Sewaholic or the Juniper trousers by Colette Patterns, both of which I own and both of which have a fly front. My fabric of choice will be red gabardine (mmm red gabardine…) and the image I have in my head is decidedly nautical, maybe helped along by these inspiration pictures? By Burda member Fletcher and Fenn. Love the nautical detailing. 2. A fabulous, extremely helpful, step-by-step sewalong by none other than Lauren Lladybird already exists. 1. I already own a pair of black Banana Republic trousers that could be a Thurlow twin separated at birth. 2. I never wear them, even though they fit me like a glove, maybe there's a reason for this? 3. I'm not that keen on boot cut trousers (see above). 1. The instructions look comprehensive, plus all the steps seem to be covered on various Coletterie tutorials if I get stuck. 2. Dixie DIY has made an awesome denim pair which look great, she gave the pattern a positive review too, which is encouraging. 3. Fab high fitted waist and vintage cut. 4. Would be a great match for lots of my vintage style blouses and wedge shoes. 2. The ginormous width of the legs….can leg width be reduced? This is yet another variation on the Colette Patterns Peony dress. Yes, this is now my fourth version (here are the first, second and third), but I love the shape, it suits me and I can get it to fit me well, so why not? It's made from navy sweatshirt knit fabric (Goldhawk Road, £4.50 a metre), with leftover red double knit scraps used for binding the neck and cuffs. Sweatshirt knit isn't the most glamorous fabric in the world, but it's so cosy and warm, I love it. I sewed it in exactly the same way as my last knit Peony, the only difference being that this time I tried some extremely fine fusible knit stay tape from A Fashionable Stitch on the neckline and hem. I'm still not entirely sure what I'm doing when I'm trying to stabilise a neckline, but it seemed to give a good, smooth finish. I can definitely tell the difference on the hem, it hangs perfectly. 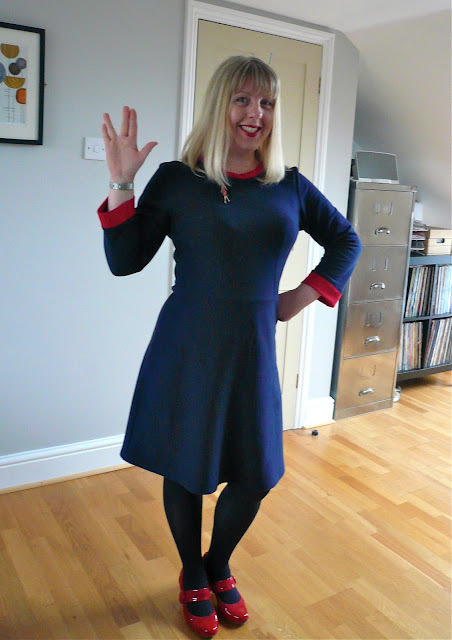 One big plus is that whenever I wear this dress, I get a distinct Star Trek vibe. 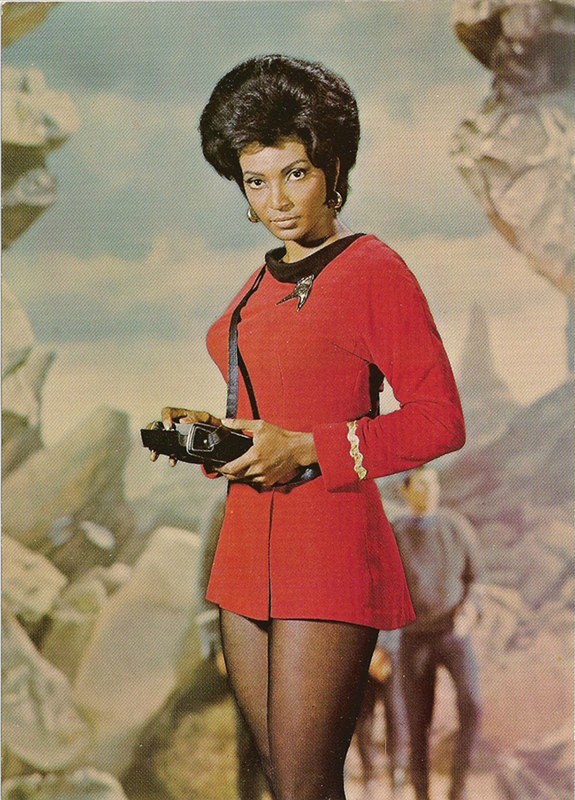 If you reversed the colourways and shortened it by about a foot, it could almost be something Lieutenant Uhura would wear. Sort of. Today, I'm going to share my tutorial for adding a lace trim to a Peter Pan collar. I worked out how to do this whilst making my Alma blouse for the Watch this Lace challenge. Although there was a lot of initial head scratching as I tried to work out what went where, it's actually pretty straightforward. Sharing this tutorial is part of Sew Grateful Week, hosted by Debi at My Happy Sewing Place. There's barely a day goes by when I don't look up an online tutorial or try to find the answer to a sewing conundrum. And there's ALWAYS a solution that works for me on a sewing blog somewhere! I'm eternally grateful to the online sewing community for this generous sharing of knowledge, so this tutorial is my little way of giving something back. You'll need to start with a pattern for a Peter Pan style collar. I'm using the Sewaholic Alma pattern which has separate front and back collar pieces (some patterns may have the collar as one piece.) Follow the pattern instructions for the very first stages of making your collar. In my case, this comprised cutting out the pattern pieces, transferring markings, fusing interfacing to the collar pieces and sewing the front and back collar pieces together. We're going to start the tutorial from this point, so make sure you've done all your prep work beforehand. 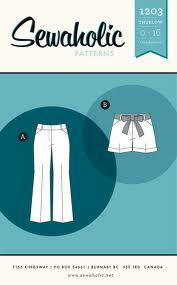 Prepared pieces of your preferred collar pattern (see above). 1 to 1.5 metres of lace trim depending on the size of your collar. My collar required almost exactly a metre, but it's always worth buying more than you need for contingency. 1. First you're going to measure the width of our lace trimming. Mine is 6/8ths of an inch at the highest point. 2. Then you need to decide how much of the lace trim you want to peep out along the edge of the collar. I decided I just wanted the top scalloped layer to show. Measure this distance - mine was 2/8ths of an inch (or a quarter of an inch if you prefer). Now for a teeny tiny bit of maths (don't panic Captain Mainwaring, honestly it's simple!) Subtract the second measurement from the first measurement. In my case it was 6/8ths minus 2/8ths = 4/8ths (or half an inch). That's it! That's all the maths you'll need to do. And believe me, if I can work that out with my abysmal maths track record, then anybody can. So my seam allowance for when we get to step seven is half an inch. IMPORTANT point, you only need this seam allowance for step seven and NOT before. 3. Right, back to the collar. Start by making tiny snips in the lace trim at half inch intervals. Do this along the entire length of your lace. This will make the lace much more pliable when you're placing it around curves. Remember, Peter Pan collars are VERY curvy! 4. With RIGHT sides together, pin the lace trim right around the outer edge of the TOP collar, making sure that the snipped edge of the lace is flush with the edge of the collar. Use as many pins as you need. 5. Sew the lace trimming to the collar using a small seam allowance. I used the width of my presser foot which is about a quarter of an inch. 6. Now we're going to make a collar and lace sandwich. Place the under collar (or collar facing, depending on what your pattern calls it) RIGHT SIDES TOGETHER with the top collar that you've just attached your lace to. Pin it carefully all the way round. 7. This is the point where you need to apply the seam allowance you worked out earlier. In my case it's half an inch. Sew the two layers together, right round the edge, using the correct seam allowance. You'll see that you now have two lines of stitching: one from when you attached the lace and the second from sewing the front and back collar pieces together. 8. Pattern instructions always tell you to notch around a collar edge for a smooth line, but I've always preferred to trim the seam allowance right down. In my experience it gives a much cleaner, angle-free line. It's entirely up to you which route you choose. If you do decide to trim the seam allowance right down, make sure you don't cut through any of the lines of stitching! 9. Now for the exciting bit! Turn the collar the right way round and press carefully, paying particular attention to the curved edges. Use a pointed object to ease out all those curves. You should end up with a lovely, lace trimmed collar like this. 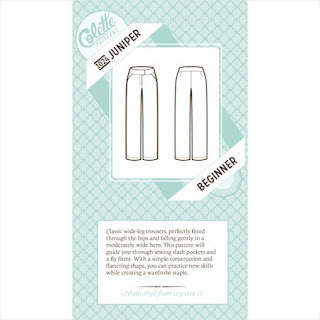 Edit: You could also use the principles of this tutorial to apply a ric-rac trim - thank you to Joanne from Sew Little Time for the great suggestion! Have you been following Marie's Watch this Lace series over at A Stitching Odyssey? If for some bizarre reason you haven't, then please hot foot it over there immediately. Thank you. Marie very generously gifted five metres of beautiful vintage lace each to eight sewing bloggers, challenging them to incorporate it into whatever took their fancy. The series is about half way through now and it's been amazing, with some truly beautiful and inspirational makes. And today's seamstress is none other than me!!! The construction details and finished pics are on Marie's blog, but I thought I'd go into a bit more detail here about what inspired me. I'll probably repeat some of the finished blouse shots too, just because. Apart from trimming a hem, I've never used lace in my sewing before so I needed to think long and hard about how to use it. As I'm not a particular lover of frills and flounces, my version was always going to be a bit reserved. I initially wanted to used the lace around the neck, but visions of Lord Percy from Blackadder kept popping into my head. If you're a Tudor Lord then you can clearly pull this look off, especially if you have a spare set of doublet and hose to hand. Sadly, it wasn't a look that was going to work for me. I also wanted the finished garment to fit in with the rest of my wardrobe and be something I'd want to wear. So I decided to use the lace as a border/edging on a collar. 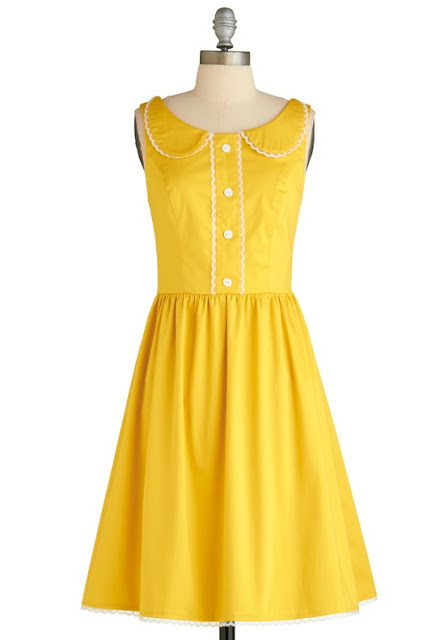 I was inspired by this picture of a Modcloth dress that I'd pinned to my yellow board on Pinterest, and decided that I could use the Alma blouse pattern as the collar has quite a similar shape. To get the look I made a fake placket, using the method from the Colette Sorbetto pattern. But instead of just attaching the placket at the top and bottom as per the Sorbetto, I top stitched down each lace trimmed placket edge. The final amount of lace is just right in my book: not too frilly but having enough peeking out to draw the eye. Attaching the lace to the collar edge was a little more involved, but still pretty straight forward. I took some pictures as I went along and I think I can remember how I did it...(!) so if anybody's interested in a tutorial, just shout and I'll make myself remember.